Ever feel the need to kick your spouse, boyfriend, or partner out of the car while you’re driving long distances on the freeway? It occurred to me as we made our trek to Legoland. It was supposed to be a joyous occasion and it was in the end … but the beginning tested my patience and we were in what my friend likes to call “silent mode”. I felt like I was in the car with Gilligan on a three-hour tour … a three-hour tour! As a mom, I can understand I’m a little neurotic. But there’s a reason for that craziness. Everything I do is for a specific reason. And no … it’s not so I can hear myself talk or give my dude a list of things to do. It’s to avoid THE MELTDOWN. When you have kids and you’re on a journey that lasts more than one hour in a car your mission becomes avoiding THE MELTDOWN — when your kids lose it, when they cry because of boredom, when they cry because there is no television or video games, when they cry for a ridiculous reason, when they cry in general, when they cry because it’s nap time, when they cry because they’re hungry, or when they cry for no reason. You do your best to avoid it. That was my entire plan on a trip that the GPS stated would take an hour and forty-four minutes. However that approximate time did not include meltdowns and unforseen detours. The park opened at ten and I wanted to get there around that time, give or take fifteen minutes, so my son could thoroughly enjoy all the attractions. Last year we failed to anticipate how long the drive would be, so we arrived after noon, where he was cranky because he didn’t sleep in the car, and the park closed at five. We felt bad about cheating my son out of the full Legoland opportunity, so I vowed that wouldn’t happen this year. I did everything I thought I could to prepare, but the forces of destiny played tricks on me. My plan included leaving early … just as the baby takes her first nap. Figured she would sleep all, or most, of the way there and we’d be cry-free for the drive, while my son played with most of the toys or books I packed. We were supposed to leave around 8:30 a.m., but getting everything together in the morning took longer than usual. So I skipped breakfast, figured we could get some kind of sandwich somewhere. We made it out the door around 9:30 a.m.
Once we were in the car we thought about the coupon. It could have saved us sixty-two dollars. Now for some people, sixty-two dollars isn’t much, but when you have a family of four and you know there’s going to be ten-dollar popcorn and eight-dollar hot dogs, you try to save anywhere. Did I mention the coupon during the week? All he had to do was eat lunch at Denny’s, which is like 20 feet away from his work, and we’d get the free-ticket coupon. So he assured me we could stop by on the way there. No big deal, we would eat there. But before that ever happened we had to drop off one of his friend’s cell phones, which took about thirty minutes. Was it in the opposite direction? Did we absolutely have to drop off the phone that morning? Could his friend have waited until the evening for his lost phone? Baby crying. Passed nap time. Son anxious and getting cranky. Mom frustrated, no food. Hypoglycemic — just a nice way of saying bitchy because I was starving and had a headache. We finally made it to a Denny’s, the one near his place of business, and the baby falls asleep. I suggested we take the food to go, so that the restaurant noises do not wake up the baby. I got off the car and asked the hostess lady about the coupon special, she told me there were no more coupons. They ran out yesterday. Forget the coupon, just leave. We need to get something to eat. I’m starving. I’ve got a headache coming and we’ve now been in the car for about an hour. My son’s patience is non-existent. I give him a snack, but he’s still in a crappy mood. He seems to be hypoglycemic too. He asks about Legoland again, for the hundredth time. Again I tell him we’re almost there, be patient. About fifteen minutes later, my son gets a headache. He begins to complain about the headache. He gets loud. Baby awake. Baby crying. Pacifier missing. Baby’s crying intensifies my son’s headache. We pull over and try to comfort my son and find the pacifier. He stretches his legs for a little bit, then decides he needs to use the bathroom. After this twenty-minute detour, we get back in the car. Baby still crying. I move to the back seat to try to comfort and distract everyone. Baby settles down for a second, then starts up again. Oh! There’s a Dennys right there. Driving too fast to make the off ramp. There’ll be another one down the line. Baby still crying. Son still cranky and head still hurting. I continue my efforts to comfort and realize the baby has pooped. We exit. The baby’s poop made its way up her back and all over her clothes. After changing diapers and clothes, we pile back in the car and drive. I’m desperately searching the car for ibuprofen. My head is pounding. My dude decided to take another freeway so as to avoid heavy traffic. It’s a loop, but it’ll be faster than the current freeway we’re driving on. We drive the detour and encounter gridlock. After waiting for all those cars to crawl out of our way, we drive thirty more minutes and see the sign: Legoland Next Exit. Did you see that Legoland next exit? I thought you said next exit, not this one. So envisioning throwing him out of the car. Tuck and roll, dude. Tuck and roll. Eventually we made it to our destination, cranky as hell. But once I saw my son’s eyes light up as we drove into the parking lot, I was ready to rid myself and my dude of that nasty mood and of the three-hour tour … that three-hour tour. EVERYONE feels that way sometimes! At least you put those feelings to good use! Oh, man…I miss the days when my kids were small, but I’d forgotten about those car trips; don’t miss those at all. Nice post! Yikes! I think I would have been as frustrated as you were. Glad the arrival and the excitement made it worth it. (And now you have me wanting to look at my pictures from our visit to LEGOLAND Chicago). By the way, Susie sent me. Susie gave me your address. Hello! I came over from Susie’s party today. Popped over from Susie’s party. And may I say that I totally feel your pain! When my son was a toddler and up to around 6 years old, I had to plan our outings very carefully, so he wouldn’t melt down. He had such trouble (he has Sensory Processing Disorder). And if I had to deal with your man doing what he did (or didn’t) do to help your trip, I’d have gone ballistic on him. 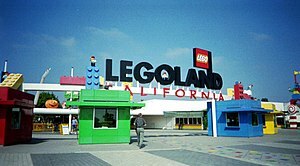 One of these days, we need to make it to LEGOLAND. My son is more than addicted! That was most certainly an adventure! And, yes I have wanted to throw my hubby out of the car on occasion. I stopped by from Susie’s blog by the way! This is so funny! We call it the HANGRIES! Now I won’t go on a trip without something handy to munch on just in case. Leaving the coupon behind sounds like something I would do. Thanks for bringing it to the party. Have fun clicking on links. More should join us over the weekend!